Durga Ashtami or Maha Ashtami is one of the most auspicious days of five days long Durga Puja Festival. This day is also known for 'Astra Puja'(Worshiping Weapons) as on this day the weapons of goddess Durga are worshiped. It falls on bright lunar fortnight Ashtami tithi of Aswina month according to the Hindu calendar. 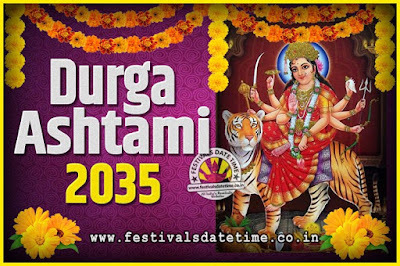 The eighth day of Durga Puja, that is, Ashtami is on the eighth day of Navratri. This day is most important compared to other days because this day symbolizes the win of good over evil. This puja is done on the eighth day for some while for others it is done on all the nine days of this festival. This puja is also known as kanya puja or kanjak puja. On this day, nine small pots are kept and people perform some rituals.